One unique feature that stands out with the Sensything is its “out of the box” approach. You may wonder what is so unique about it. Where else can you find a board that you can immediately use once you unbox it. The board is “READY TO USE”. For all, you eager enthusiasts, who cannot wait to explore new hardware then do go for it. We would be happy to hear from you! If you have purchased the Sensything - board only version then you will have to bring your own battery, and cables. This video throws light on how to set up your Sensything device. Get set Go! 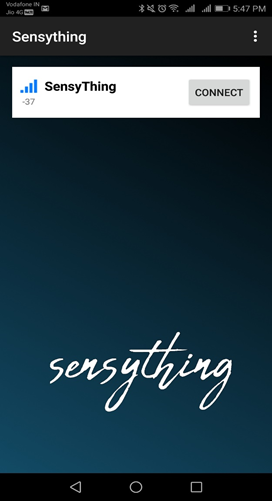 Note: The Sensything App is currently available for Android users on Google Play store. The ios version will be coming soon. Stay tuned for updates! A short video suggests how to connect a basic analog sensor like the Piezo vibration sensor to Sensything. The”Connect” option for the device. Graphical representation - This depicts the changes in the readings of the sensors. All major and minor fluctuations are picked up. Analog channels - The four channels gives the ADC values received from the plugins on the board. 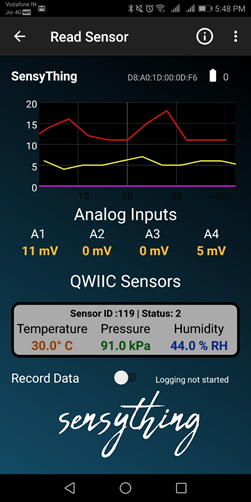 Qwiic section - In case any qwiic connection is made the values will be shown there. Data logging - Using the Application you can log your data so that the data is saved directly to your mobile device. Note: On the right-hand corner there is a battery indicator, this detects the level of charge in the Sensything device.